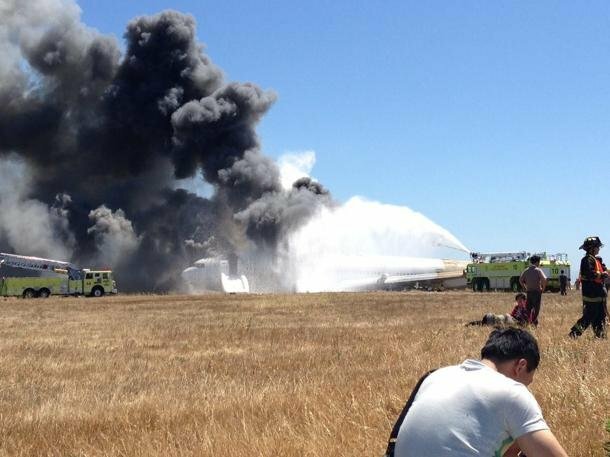 Hom, a senior software engineer at a Silicon Valley company, was a passenger on Asiana Airlines Flight 214 when it crashed-landed at San Francisco International Airport on July 6. He walked away from the crash unscathed and told his story to Yahoo News in an exclusive interview on Monday. The plane’s breathing masks came down as parts of the fuselage started breaking off. Personal belongings were thrown about; Hom lost his flip flops. “I wasn’t sure what we were supposed to do at that point,” he said. He said he remembers focusing on finding his footwear and noticing that his middle-row seatmates had put on the breathing masks although the air wasn’t smoky. Much remains a blur for Hom. He doesn’t recall hearing instructions from the flight attendants, but he did see one helping passengers through the escape chute. Some passengers were visibly upset, but mostly everyone was calm. It wasn’t until Hom got to the chute and looked up into the sky that he saw smoke. “The flight attendants were still on the plane, making sure everyone was getting off safely,” Hom says. Once they made distance, passengers gathered in small groups—and only then did those sitting in Hom’s area see the severed tail. Hom saw at least seven people who looked as if they were in serious condition. One woman was laid out on the grass, and fellow passengers were trying to summon rescue workers to attend to her. “They were a bit slower than we hoped,” he says. The initial scene was of chaos. Even now, investigations are underway to see if an emergency vehicle may have contributed to one of the two fatalities: Chinese schoolgirls Ye Mengyuan and Wang Linjia. Eventually the uninjured were separated from the injured. 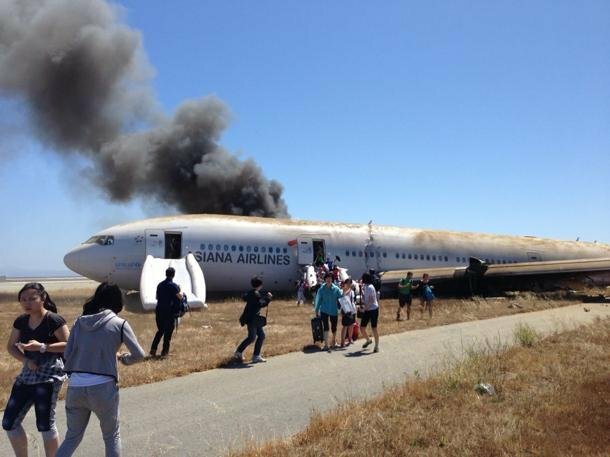 Asiana Airlines personnel were on hand to translate for the diverse group of 291 passengers, which included 61 Americans, 77 South Koreans, 141 mainland Chinese and and 1 Japanese. “We were in the runway for quite a long time,” Hom says. Buses came to transport passengers, who were divided again between injured and uninjured, Hom said. They were moved through customs, then to a lounge. By then, security was in place to make sure nobody left and even escorted passengers to the restroom. The heightened security made Hom think officials weren’t taking anything for granted — including considering the possibility of a terrorist act — although nobody ever stated so. As people waited, they compared notes, lent phones to call loved ones, and played cards. One woman borrowed Hom’s phone to call her husband in Colorado; she and the two kids would miss the connecting flight, but the children were frightened and wanted their father to come pick them up. This was their first vacation. Hom also talked with David Eun, the Samsung executive who sent tweets about the crash. 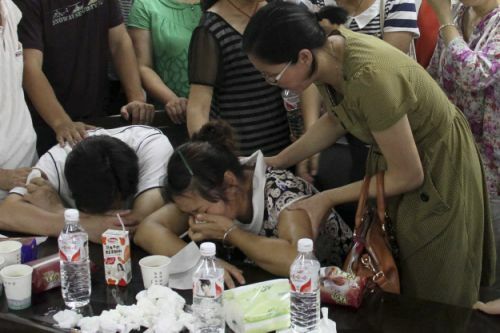 Hom hadn’t wanted to post anything on his social network; his family and friends thought he was coming directly from Thailand, and he didn’t want his mother to worry. In fact, he told her upon landing that his luggage had been delayed, and it would take a while. She guessed the truth, though, when she called again around 4 p.m.. “She wasn’t mad,” he says. After the passengers provided their contact information to the FBI, they were finally let go around 5 p.m.